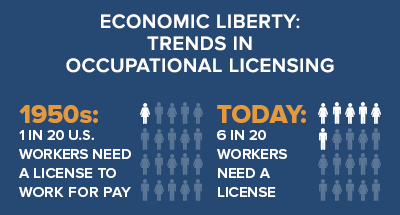 On September 24, 2018, the Economic Liberty Task Force released its Options to Enhance Occupational License Portability report. Nearly thirty percent of American jobs require a license today, up from less than five percent in the 1950s. For some professions, licensing is necessary to protect the public against legitimate health and safety concerns. But many more occupations could be practiced safely and effectively with fewer, or no, licensing requirements. stifle price, quality, and service competition among professionals, which hurts all consumers. Based on recent studies, the burdens of excessive occupational licensing – especially for entry- and mid-level jobs – may fall disproportionately on our nation’s most economically disadvantaged citizens. Even in professions in which licensing makes sense, harm often arises from the complexity and duplication of state-by-state licensing requirements and fees, combined with a lack of reciprocity among states. Unnecessary licensing requirements hit military families particularly hard; these families move often, which means military spouses often must find jobs in new states that have new and different licensing requirements. An alternative policy approach would rely on competition in the marketplace to protect the public against unqualified service providers. Voluntary certification or other mechanisms offer less restrictive alternatives that might be useful to some employers and consumers as they compare their options. The FTC’s Economic Liberty Task Force looks forward to working with our state partners and other interested stakeholders as we bring greater attention to these important issues. Occupational licensing reform is good for competition, workers, consumers, and the American economy. Learn more about the FTC's advocacy on licensing issues in various occupations. Learn more about state-based occupational licensing reform initiatives. Prepared Statement of the Federal Trade Commission, "License to Compete: Occupational Licensing and the State Action Doctrine"